Mr. Siegel points out that consensus forecasts are around $70 a share on the S&P 500. He thinks it might even be higher. The long-run average PE is roughly 15. Fifteen times 70 is 1,050. Friday, the S&P 500 closed at 1136. That's about 8% over the $1050 level so we are more or less in the ballpark of fair value. Mr. Siegel goes on discuss research of his which shows that when interest rates and inflation are as low as they are now, the average post-World War II PE ratio has been 18 to 20. As long as we don't get a sharp increase in interest rates, the fair valuation of the stock market should be higher than what we see today. A second very important factor mentioned in the interview is that 2010 is just one year out from the most severe recession in the post-war period. Mr. Siegel says earnings this year will be nowhere near what he would consider normal. If we go back in history, he says, we have usually matched, if not surpassed, the previous peak in earnings after four years or so. In 2007, the S&P 500 had earnings of $92 a share. That won't be hit in 2010. It might not even be hit in 2011. But history tells us that by 2012, we should be in the $90 range or even above. So, if you apply normal ratios -- 15 or 16, let's say -- to $90 a share, you still end up considerably higher than we are today, roughly 200 points above recent levels. In a shot at the doom-and-gloomers, he comments: "The scaremongers, who worry that the ton of money the Fed created to fight off the crisis is going to fuel the next [period of] inflation, are wrong." He contends that Bernanke has been a good enough economist to provide the liquidity necessary to prevent a repeat of the Great Depression and he will also be a good enough economist to raise interest rates to whatever level is necessary if inflation starts running into the mid-single digits or higher. In fact, he expects the Fed to raise rates sooner rather than later, which he thinks is liable to spark a correction in stocks. As investors realize, however, that rates were increased because the economy was doing well, stocks will resume their up-trend. Siegel admits there are factors that could upend his optimistic projections. One of his main fears is that commodity prices could get out of hand. If, for example, oil got back up $100 a barrel, it would "put a dent" in the recovery though he believes it would not derail the recovery. He feels commodities are fully priced at the moment but we know that can easily change as the recovery gains steam. Then there is the issue of regulation. He says he doesn't agree with everything coming out of Washington but he says he hasn't heard anything yet that is really going to "squelch the recovery." Finally, there is the U.S. deficit. Siegel feels that two-thirds of the deficit is a direct result of the recession. As the recession wanes, he says: "tax revenues will bounce back. Some spending will decline -- unemployment insurance, etc. We will move to a more manageable deficit as a result of the economic recovery." He points out that the huge liabilities of Medicare and Social Security were there before the recession and they didn't prevent the economy from booming; therefore, his opinion is that they won't prevent the economy from recovering today. He agrees with those who say we can't continue to run a deficit as big as it is today but he is optimistic that as tax revenues increase with the upswing in economic activity, the deficit will be whittled down naturally. 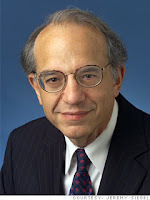 You may or may not agree with Jeremy Siegel but he has earned his reputation and his opinions should be accepted as at least one of the more well-reasoned and well-researched viewpoints among the cacophony of opinions on the web. His outlook is rather sanguine and, as a result, his investment direction leans heavily toward stocks. He believes the rate issues discussed above will make this a bad year for bonds. On the other hand, his belief in the recovery suggests this will be a good year for stocks. And he's not afraid to take a fairly aggressive position on stocks. He feels emerging markets will remain strong and that EFA (Europe, the Far East and Australasia) will be attractive. He believes U.S. stocks should also be part of the portfolio and should include small and mid-caps. So here we have another vote for better times ahead in the stock market and the economy. I sure hope Jeremy Siegel is right.